There is an extensive but little recorded human history pre-European settlement in this area, with the present county containing portions of regions populated by a number of Native American tribes. The earliest definitively established occupation by modern man (Homo sapiens) appears to have occurred six to ten thousand years ago. However, there may have been human presence far earlier, at least as far as non–settling populations are concerned. The known settled populations were hunter-gatherer societies that had no knowledge of metals and that produced utilitarian crafts for everyday use (especially woven reed baskets) of the highest quality and with graphic embellishments of great aesthetic appeal. Extensive trading from tribe to tribe transferred exotic materials such as obsidian (useful for the making of arrowheads) throughout the region from far distant Californian tribes. Unlike the nomadic Native American of the Great Plains it appears that these tribes did not incorporate warfare into their culture but were instead generally cooperative. Within these cultures the concept of individual or collective land ownership was nonexistent. Early European settlers in the region, however, did not record much about the culture of the natives. Most of what is known culturally comes from preserved contemporaneous and excavated artifacts and from inter-generational knowledge passed down through northerly outlying tribes of the larger region. In 1821 Mexico gained independence from Spain. While little changed in ranchero life, the Mexican War of Independence resulted in the secularization of the missions with the re-distribution of their lands, and a new system of land grants under the Mexican Federal Law of 1824. Mission lands extended throughout the Bay Area, including portions of Contra Costa County. Between 1836 and 1846, during the era when California was a province of independent Mexico, the following 15 land grants were made in Contra Costa County. In 1834 Rancho Monte del Diablo (present day Concord, California) was confirmed with 17,921 acres (72.5 km2) to Salvio Pacheco (born July 15, 1793, died 1876). The Pacheco family settled at the Rancho in 1846 (between the Pacheco shipping port townsite and Clayton area, and including much of Lime Ridge). The boundary lines were designated with stone markers. Clayton was later located on sobrante lands just east of Rancho Monte del Diablo (Mount Diablo). The exclusive land ownership in California by the approximate 9,000 Hispanics in California would soon end. John Marsh, owner of Rancho Los Meganos in Contra Costa County, had a lot to do with this. He sent letters to influential people in the eastern United States extolling the climate, soil and potential for agriculture in California, with the deliberate purpose of encouraging Americans to immigrate to California and lead to its becoming part of the United States. He succeeded. His letters were published in newspapers throughout the East, and started the first wagon trains rolling toward California. He also invited them to stay on his ranch until they could get settled, so the Rancho Los Meganos became the terminus of the California trail. In 1850 California had a non-Indian population of over 100,000. The number of Indians living in California in 1850 has been estimated to be from 60,000 to 100,000. By 1850 the Mission Indian populations had largely succumbed to disease and abuse and only numbered a few thousand. California's 1852 state Census gives 31,266 Indian residents; but this is an under-count since there was little incentive and much difficulty in getting it more correct. During World War II, Richmond hosted one of the two Bay Area sites of Kaiser Shipyards and wartime pilots were trained at what is now Concord/Buchanan Field Airport. Additionally, a large Naval Weapons Depot and munitions ship loading facilities at Port Chicago remain active to this day, but with the inland storage facilities recently declared surplus, extensive redevelopment is being planned for this last large central-county tract. The loading docks were the site of a devastating explosion in 1944. Port Chicago was bought out and demolished by the Federal Government to form a safety zone near the Naval Weapons Station loading docks. At one time the Atlas Powder Company (subsequently closed) produced gunpowder and dynamite. The site of the former Atlas Powder Company is located at Point Pinole Regional Shoreline, part of the East Bay Regional Parks District. According to the U.S. Census Bureau, the county has a total area of 804 square miles (2,080 km2), of which 716 square miles (1,850 km2) is land and 88 square miles (230 km2) (11%) is water. 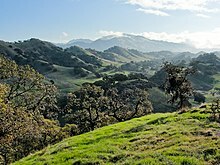 Contra Costa County's physical geography is dominated by the bayside alluvial plain, the Oakland Hills–Berkeley Hills, several inland valleys, and Mount Diablo, an isolated 3,849-foot (1,173 m) upthrust peak at the north end of the Diablo Range of hills. The summit of Mount Diablo is the origin of the Mount Diablo Meridian and Base Line, on which the surveys of much of California and western Nevada are based. The 2010 United States Census reported that Contra Costa County had a population of 1,049,025. The racial makeup of Contra Costa County was 614,512 (58.6%) White; 97,161 (9.3%) African American; 6,122 (0.6%) Native American; 151,469 (14.4%) Asian (4.6% Filipino, 3.8% Chinese, 2.1% Indian); 4,845 (0.5%) Pacific Islander; 112,691 (10.7%) from other races; and 62,225 (5.9%) from two or more races. Hispanic or Latino of any race were 255,560 persons (24.4%); 17.1% of Contra Costa County's population was of Mexican ancestry, while 1.9% was of Salvadoran heritage. As of the census of 2000, there were 948,816 people, 344,129 households, and 242,266 families residing in the county. The population density was 1,318 people per square mile (509/km²). There were 354,577 housing units at an average density of 492 per square mile (190/km²). The median income for a household in the county was $63,675, and the median income for a family was $73,039 (these figures had risen to $75,483 and $87,435 respectively as of a 2007 estimate). In 2000, the largest denominational groups were Catholics (with 204,070 adherents) and Evangelical Protestants (with 74,449 adherents). The largest religious bodies were the Catholic Church (with 204,070 members) and The Baptist General Conference (with 24,803 members). The Rohr Jewish Learning Institute teaches courses in the county. According to the California Secretary of State, as of October 24, 2016, Contra Costa County has 607,515 registered voters, out of a population of 1,037,817 (58.5%). Of those, 306,029 (50.4%) are registered Democrats, 132,405 (21.8%) are registered Republicans, and 143,876 (23.7%) have declined to state a political party, also known as "No Party Preference" or "NPP." Democrats hold wide voter-registration advantages in all political subdivisions in Contra Costa County. The Democrats' largest registration advantage in Contra Costa is in the cities of Richmond where there is a 60.3% registration advantage with only 3,192 Republicans (6.2%) out of 51,395 registered voters compared to 34,159 Democrats (66.5%) and 12,095 voters who have no party preference (23.5%), El Cerrito where there is a 59.0% registration advantage with only 1,169 Republicans (7.4%) out of 15,877 registered voters compared to 10,543 Democrats (67.6%) and 3,654 voters who have no party preference (23.0%), and San Pablo where there is a 58.3% registration advantage with only 641 Republicans (6.1%) out of 10,550 registered voters compared to 6,793 Democrats (64.4%) and 2,746 voters who have no party preference (26.0%). The development of commuter railroads proceeded together with the subdivision of farms into parcels. In some cases, such as the development of Saranap, the same developer controlled both the railroad (Sacramento Northern) and the development. These early suburbanization developments were an extension of the earlier development of trolley car suburbs in what are now considered the highly urban environments of the near East Bay. Owing to its extensive waterfront on San Francisco, San Pablo, and Suisun bays the northwestern and northern segments have long been sites for heavy industry, including a number of still active oil refineries (particularly Chevron in Richmond, Shell Oil and Tesoro - in Martinez), chemical plants (Dow Chemical) and a once substantial integrated steel plant, Posco Steel (formerly United States Steel), now reduced to secondary production of strip sheet and wire. The San Joaquin River forms a continuation of the northern boundary turns southward to form the eastern boundary of the county. Some substantial Sacramento-San Joaquin Delta "islands" (actually leveed former marshes) are included in this corner of the county. The central part of the county is a valley traversed by Interstate 680 and Highway 24. The towns east of the hills, on or near Highway 24 and their surrounding areas (Lafayette, Moraga and Orinda) are collectively known as Lamorinda. The major central county cities along Interstate 680 are Martinez, Concord, Pleasant Hill, Walnut Creek, Danville, San Ramon, and unincorporated Alamo. Owing to the high quality of its public schools (due largely to both demographics and added support from prosperous parents), this area has become a magnet for well–off families with children. During the real estate boom, housing prices were driven to astounding levels. From 2007, home prices in the region have seen substantial decreases and the affordability rate has risen. During the real estate boom, the high price of homes and scarcity of land resulted in many speculators purchasing older, smaller homes and partially or completely tearing them down to construct larger homes. Other cities in the once heavily industrialized northwestern and western waterfront areas such as Richmond have fallen on harder times, with Richmond having difficulty balancing its school budget. Two forces have combined to create county budget problems peaking in 2008. First, (over a thirty-year period) rather than compensate police, medical, and firefighting personnel directly, very favorable health and retirement benefits were granted without proper actuarial examination, leading to unexpected (yet predictable) high costs as personnel age and ultimately retire with continued "first class" health and retirement benefits. Second, the collapse of the "housing bubble" has enabled purchasers of distressed properties (many of which are owned by banks and other mortgage holders) to petition for lower property assessments, in many cases reducing by half the revenue to the county for specific parcels. Continuing downturns in employment prospects (particularly in new housing construction) have further increased the needs for various social services. These deficits and demands, combined with a lack of support from a similarly stressed California state government and the United States Federal government have combined to require unpleasant choices to be made by county supervisors and county service providers in the allocation of limited resources in a time of increasing demand. The projected budget deficit is $45 million as of early 2011. Perhaps more significantly, the total unfunded liability for retiree benefits is $2.4 billion. In the 1970s and 1980s many small and innovative technical firms were started in this county, most of which are no longer present, having either failed, been absorbed into larger corporations, or having outgrown their original location are now elsewhere in the Bay Area. During the 1980s and early 1990s, many corporations that were formerly housed in the more central metropolitan area followed their employees by moving to large suburban and edge city office areas and office parks. A number of large corporations now have headquarters in large developments along what is called the 680 corridor, that segment of Interstate Highway 680 that extends from Concord in the north to San Ramon in the south, continuing into inland Alameda County from Dublin to Pleasanton. By the early 1990s, more square footage of office space had been built in the 680 corridor than in San Francisco's Financial District. There are currently political fights over the potential redevelopment of the county seat (Martinez), with long term residents and many elsewhere in the county concerned that it will lose its remaining small-town charm and utility in an effort to become more like the county's major recreational shopping center of Walnut Creek. The inland portions of the Concord Naval Weapons Station have been declared surplus by the Federal government and this area is expected to provide what is likely the last opportunity to plan and build city-sized development within the central county. This area will become a portion of the city of Concord, and planners expect that development will be confined to the lower and flatter portions of the depot, with the remainder becoming a substantial addition to the county's open space. Much of the land to be developed is relatively flat grassland and the most prominent structures are ammunition bunkers that will be removed, so future uses of the property are largely unconstrained by previous uses. The city of Concord is served by the daily newspaper, the Contra Costa Times published by the Bay Area News Group-East Bay (part of the Media News Group, Denver, Colorado), with offices in Walnut Creek. The paper was originally a paper run and owned by the Lesher family. Since the death of Dean Lesher in 1993, the paper has had several owners. The publisher also issues weekly local papers, such as the Concord Transcript, which is the local paper for Concord and nearby Clayton. The population ranking of the following table is based on the 2010 census of Contra Costa County. ^ "Contra Costa County, California Official Website". Retrieved 2009-01-24. ^ "Contra Costa County Mexican Land Grants". Lib.berkeley.edu. 2003-06-16. Retrieved 2012-09-22. ^ "East Bay Regional Parks | Embrace Life!". Ebparks.org. Retrieved 2012-09-22. 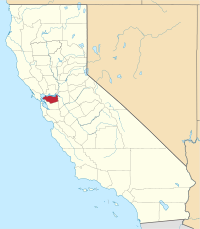 ^ "Contra Costa County, California - Fact Sheet - American FactFinder". Factfinder.census.gov. Retrieved 2012-09-22. ^ "County Membership Reports". thearda.com. Retrieved 2011-08-22. ^ "County Membership Reports". thearda.com. Retrieved 2010-08-22. ^ "CBS News article". January 31, 2011. Retrieved 2011-03-02. ^ "blackhawkmuseum.org". blackhawkmuseum.org. 2012-11-17. Retrieved 2012-11-22. ^ "Museum of the San Ramon Valley". museumsrv.org. Retrieved 2012-11-22. ^ "Diablo Foothills Regional Park". Ebparks.org. 2012-09-27. Retrieved 2012-11-22. ^ "Las Trampas Regional Wilderness". Ebparks.org. Retrieved 2012-11-22. ^ "Iron Horse Regional Trail". Ebparks.org. 2012-10-17. Retrieved 2012-11-22. ^ "Contra Costa Canal Trail". Ebparks.org. 2012-09-13. Retrieved 2012-11-22. ^ "Delta de Anza Regional Trail". Ebparks.org. Retrieved 2012-11-22. ^ "Briones to Mt. Diablo Regional Trail". Ebparks.org. Retrieved 2012-11-22. ^ "Lafayette-Moraga Regional Trail". Ebparks.org. Retrieved 2012-11-22.